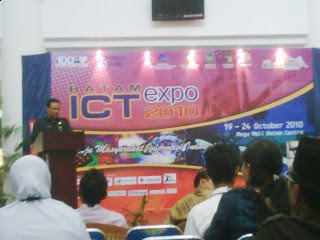 The event titled ICT Expo 2010 held in the East Atrium Mega Mall Batam Centre, followed by telecommunication providers such as Telkom, Telkomsel, Indosat, and XL Axiata. On the activities of Information and Communications Technology exhibition, each promo-providers compete to provide the special promo for the sake of attracting visitors. One of them is offering a promotional purchase Telkomsel single modem unit Telkomsel Flash is going to get a free one unit of the same modem card plus two prime Telkomsel Flash unlimited package. "This is one form of our participation in order to enliven the event SingTel ICT Expo 2010. Promo that we offer is buy one get one free. So every purchase of a modem Telkomsel Flash, customers will get an additional modem for free. Plus card prime Telkomsel Flash Unlimited . And this promo is only valid at the location during the ICT Expo Expo is held, "a representative of SingTel, Sony Darmawan, when the opening ceremony of the ICT Expo, Tuesday (10/19/2010). While providers Indosat entered into the contest during expo events take place. The contest is named Indosat Wireless Innovation Contest (IWIC). According to representatives of Indosat, Alfredo, this contest is the fifth time the event was held Indosat with a gift of hundreds of million rupiah. The contest is intended for the community of programmers who have innovation in programming applications. This year is the third year convening of the ICT Expo, and themes raised in the exhibition this year is Towards the Information Society of Indonesia. The event will last for six days, Tuesday-Sunday (19-24/10/2010). The exhibition was officially opened by Vice-Mayor of Batam, Ria Saptarika.